As a small business owner you are often so overwhelmed that time slips right through your fingers while handling everything that needs to be done. For this plight, RescueTime is here to help you manage your hours more effectively so that you get more accomplished in a day. This application tracks the time that you are spending on various websites and applications, because many people are prone to being easily sidetracked. Even if frivolously wasting time is not one of your flaws, the app can be used to track the amount of time spent on the aforementioned tools and even offline activities like meetings and phone calls. More than just time management, RescueTime also helps users to set and achieve goals, which is noted on the dashboard and covered in weekly e-mail reports so that you are consistently aware of your progress. 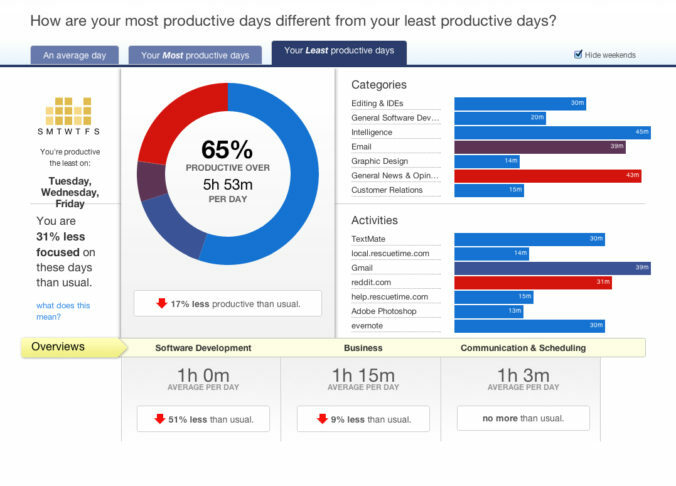 As with most of the other services here, RescueTime provides users with a free and paid version. The paid service is $9 per month and comes with some bonus features like website blocking for those that only waste your time, alerts and other impactful elements. We know small business owners can use all of the help they can get. In most cases, employing an ample staff is just out of the question and not at all efficient. Smart usage of these and other technological companions help save you time, money and mental stability. Let these tools be part of your staff, and empower you to use your superhero abilities rather than waste time on tedious tasks.